A NASA rover celebrates eight years on the Martian surface on January 24, and the long-lived robot is still going strong. The Opportunity rover landed on the Red Planet at 9:05 p.m. PST Jan. 24, 2004 (12:05 a.m. EST Jan. 25), three weeks after its twin, Spirit, touched down. While NASA declared Spirit dead last year, Opportunity continues to gather data in its dotage, helping scientists understand more and more about Mars’ wetter, warmer past. Opportunity reached a multi-year driving destination, Endeavour Crater, in August 2011. 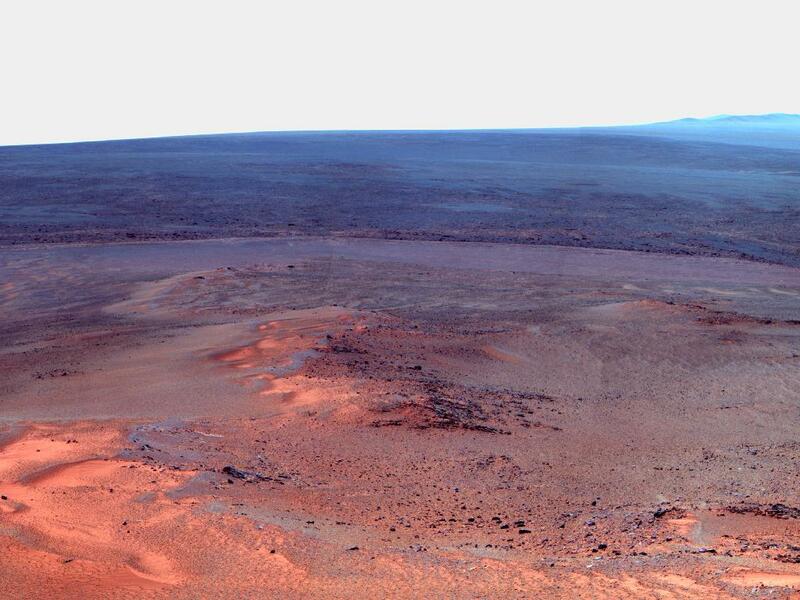 At Endeavour’s rim, it has gained access to geological deposits from an earlier period of Martian history than anything it examined during its first seven years. It also has begun an investigation of the planet’s deep interior that takes advantage of staying in one place for the Martian winter. Mars years last nearly twice as long as Earth years. Entering its ninth Earth year on Mars, Opportunity is also heading into its fifth Martian winter. Its solar panels have accumulated so much dust since Martian winds last cleaned them, more than in previous winters, the rover needs to stay on a sun-facing slope to have enough energy to keep active through the winter. All six of Opportunity’s wheels are still useful for driving, but the rover will stay on an outcrop called “Greeley Haven” until mid-2012 to take advantage of the outcrop’s favorable slope and targets of scientific interest during the Martian winter. After the winter, or earlier if wind cleans dust off the solar panels, researchers plan to drive Opportunity in search of clay minerals that a Mars orbiter’s observations indicate lie on Endeavour’s rim.